This is going to be a regular entry at the end of the day, to bring a little more truckliness to your evening. Thought about opening up the series with some vulgar display of power or Dakar desert-racing action... but I'm old fashioned, so we're kicking it off with a nod to our truckly ancestors. This retired rig is a Fargo, and looks to be from the early 1950's. Though we recognize it as a pickup, Chrysler history site Allpar tells us the truck would have been described as an "express body" in its day. Apparently that was the original term for pickups when the bodystyle gained popularity in the '20s and '30s. Fargo was founded in 1912 as an independent truck builder out of Chicago. Allpar says the brand was absorbed by Chrysler in 1928, after which the badge was found on a huge range of trucks from light delivery vehicles to large construction trucks. Around the same time, Chrysler was also acquiring Dodge and their subsidiary heavy-truck brand Graham Brothers. Under Chrysler's rule, Fargos were basically just rebadged Dodges for different markets until the name was abandoned in 1972. I bet there's a lot more to that story, and I just might treat you guys to it someday. For now, the more I look at this photo the more I realize I love derelicts. 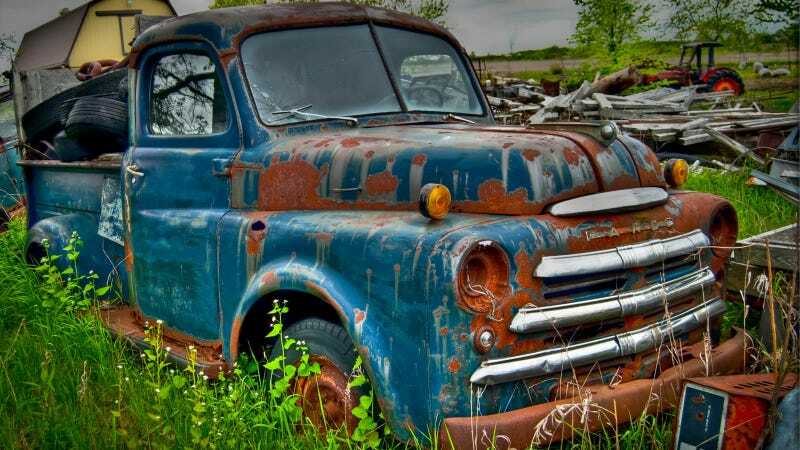 "Rust In Peace" just might have to be a series all of its own, so stay tuned.